What makes syslog monitoring difficult? In a production environment, it’s common to have multiple devices sending event messages to the syslog server. Analyzing all the logs in real time is complex and requires a centralized approach. While browsing through large chunks of log data, it is difficult to find a specific log entry without using additional searching tool. Usually, as per the syslog protocol, there is no defined way for messaging. Due to this inconsistency, it might be difficult to understand each syslog message. With SolarWinds® Loggly®, a cloud-based centralized syslog viewer, you can send your data directly through syslog or by using Loggly’s HTTP API for custom applications. Those two methods let you aggregate all the logs in one place and visualize all your data. Graphical format allows you to derive meaningful insights and quickly spot issues and anomalies. Loggly supports agent-free log collection, which uses syslog to manage log data and helps you obtain in-depth knowledge about your dataset without adding further load on the devices. Since it uses syslog rather than proprietary agents for log collection, Loggly is simple to set up and maintain. Without any proper log analysis tool, administrating your data might become challenging and time-consuming. 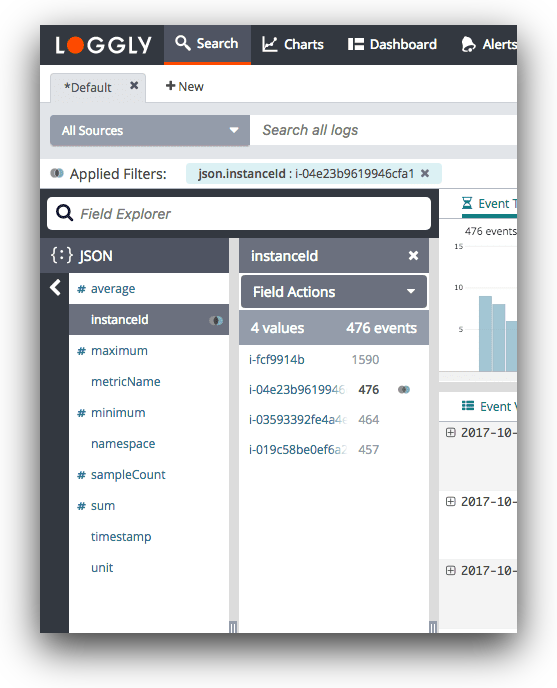 Loggly offers a comprehensive toolset offering advanced search, filtering, and charts to let you explore log data and find the primary causes of operational problems. Also, it gives you options for full-text and individual field searches using simple Lucene-like queries. With charts and customizable operational dashboards from Loggly, you can quickly derive meaningful insights from the log data. These visualizations might point you in the right direction while looking for hidden patterns and anomalies. The charts can be combined into unified dashboard and shared with your team to resolve issues collaboratively.